The corniest trope of theatrical heroism is the last-second rescue, in which the good guy swoops out of nowhere to save the girl from a hair-raising threat, and its outrageous Victorian theatricality may be the reason it appeals to Jack White. 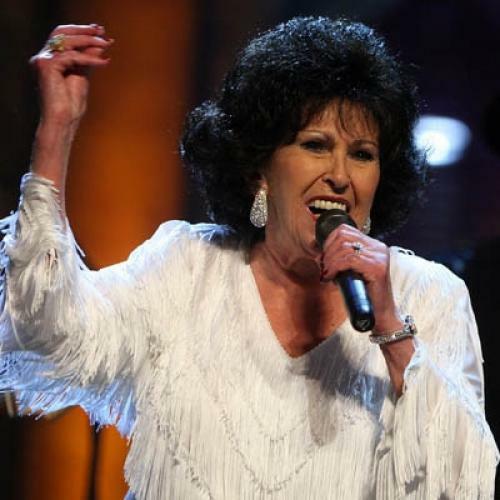 Over the past couple of weeks, White has been giving a melodramatic performance of the heroic rescue, presented as a rediscovery of Wanda Jackson, the singer and guitarist known for decades as the Queen of Rockabilly. White, who dress-rehearsed the role in his work with Loretta Lynn a few years ago, has produced a new album for Jackson called The Party Ain’t Over, which references in its title and its attitude Jackson’s hit song from 1959, “Let’s Have a Party.” White put together a brassy pop-rock band for the record and is leading a tour to promote it, and I caught one of the shows in Williamsburg last week. It was big and noisy in a conventional way, and, ultimately, depressing—not because Jackson is a 73-year-old grandmother now, but because White so badly wants her to be something else. A couple of months ago, I gave a talk at the University of Central Oklahoma, and the sponsor took me on a tour of the local museum, where I learned that Jackson started out in her native Oklahoma City as a country singer with a sultry voice and a glamorous image. She shifted into rockabilly—supposedly, at the recommendation of her one-time beau, Elvis Presley—in the mid ’50s, and it suited her. There was a spark in her that seemed dangerously close to something explosive. Born too late to know about her in her early prime, I first heard her many years later, in the late ’60s, when she had returned to commercial country music. At some point in the 1970s, I think, Jackson got religious and made another musical shift, to gospel. In time, inevitably, she was taken up by rockabilly revivalists, and she reverted full-time to her 1950s style, playing oldies tours in America and all over Europe. By the time Jack White latched onto her, Jackson was in her seventies, a grandmother who had had three or four careers doing music in three musical veins. Predictably and discomfortingly, White has packaged Jackson as hard-rockin’ badass old girl still rarin’ to party, though what she would do at the party, exactly, is not pleasant to imagine. Back-dating Jackson to her youthful days of rocking, throwing out everything else she learned and mastered as she aged and changed, White is not saving Jackson from obscurity; she has been well-known in country, rock, and gospel circles for years. He is saving her from the uncoolness of being anything except young and bad at heart, and that idea has gotten very old.